Modern industrial automation applications demand high performance instrumentation. A well-established technique is to use 4-to-20 mA current-mode transmission (rather than voltage signal) between process sensors and data-processing system elements. This method is less susceptible to the electrical noise problems common in industrial automation and control system applications. However, modern data-processing components are typically designed for voltage inputs, especially those based on digital technology. The 4-20 mA signals from remote sensors must be converted to voltage level signals, typically 0 to 5 volts, for compatibility with these components. The precision resistor converts the 4-20 mA signal from the transmitter to a voltage drop, which is compatible with the data processing components. Normally, the resistor is contained in the input circuitry of the data processing equipment. The precision of the resistor, in this case 250 O, will define the accuracy of the equipment. Two specifications define the resistor's absolute value: one is the resistance tolerance and the other is the TCR (the effect of temperature changes on the resistance value). Riedon's SAA series precision resistors utilize metal film elements and are available with tolerance to ±0.05% and TCR to ±5 ppm/°C. These encapsulated components are very rugged and can be mounted outside the input terminals of the equipment if necessary. 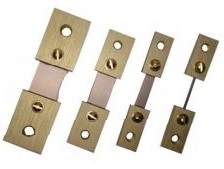 Riedon also offers precision resistors that use wire wound elements. These resistors are tolerant to ESD surges common in industrial environments. These SM and 100 Series resistors have tolerances to ±0.005% and TCR to ±1 ppm/°C. The market for industrial automation systems is large, exceeding $8B annually with over 500 US companies manufacturing equipment. The 4-20 mA transmission method remains an important component of that market, offering substantial opportunities for precision resistors to perform the I-to-V conversion.